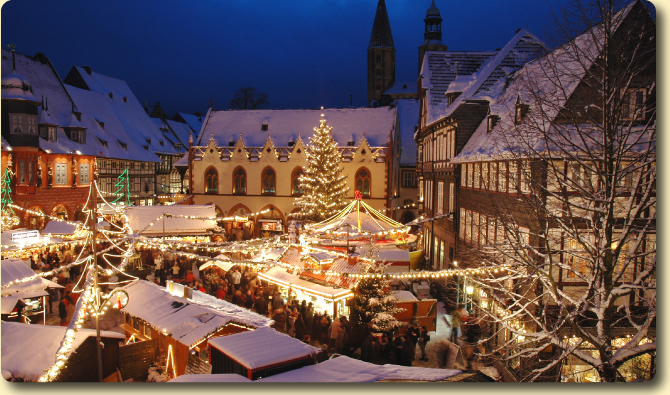 Every year the beautiful medieval market square, in the former imperial town of Goslar, is the magnificent backdrop for a Christmas Market which has around 70 romantically decorated stalls. Its main attraction is the Christmas Forest on Schuhhof: This stunning Christmas Forest, with 36 illuminated Christmas fir trees and thousands of Christmas lights, is truly straight out of a fairy tale. 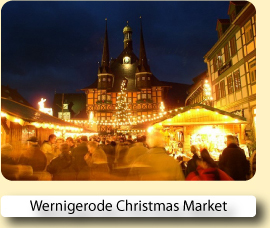 Nearby, in the historical market square of Goslar is the main Christmas market which is arranged in the shape of a star. Every day in Goslar, you’ll see musicians performing beautiful seasonal music which is mixed with the nearby aroma of fir trees and a fine selection of delicious Christmas spices. If you want to explore a bit further and if you want something really special, than climb on board a classic steam train, which will take you through the snow-covered scenery of the Harz Mountains. 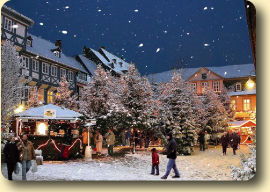 A UNESCO designated city, Goslar really is the ideal place to get into a unique Christmas spirit. 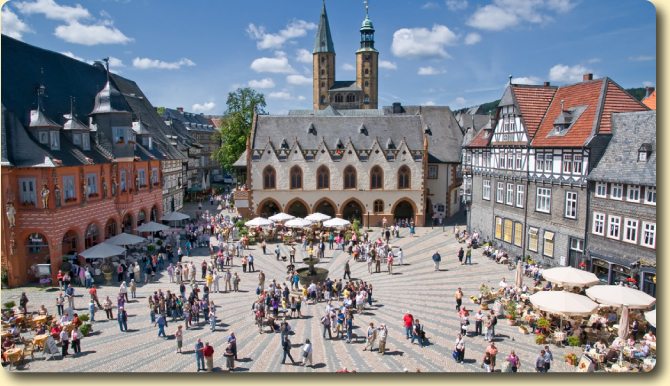 Goslar has a well preserved Old Town with a large market square, the location for the annual Christmas market. houses and cobblestone streets all making up the mediaeval face of Goslar, with the old part of the town being listed by UNESCO as a World Cultural Heritage site. The town itself and the neighbouring region have been strongly influenced by mining and visitors can now experience an exceptional collection of industrial monuments and a unique cultural landscape. These include the Emperors Palace, Goslar Town Hall and the Rammelsberg mine itself. Since the mine closed in 1988, the site has been home to one of Germany’s biggest and most original museums. Far beneath the underground, visitors are offered fascinating insights into 850 years of industrial mining history. The location is extremely convenient and close to the main square and right next to the train station. The staff is extremely helpful and kind. This is a must stay hotel. 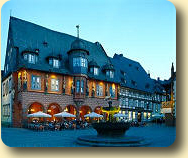 It is a historic hotel in the main square which is a pedestrian zone only. The staff are very helpful and friendly. The rooms are large. 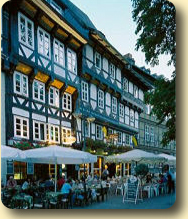 This is a nice hotel in a quiet location, ideally placed for the sights of Goslar and the rest of the Harz region. The room was very nice. Very convenient to railway and old town. Our room was huge and in a turret overlooking the station. Clean, comfortable and convenient. Buy a one day German Rail Länder Ticket and you could explore all the Christmas Markets in the state of Lower Saxony for one amazing price of: One passenger: €23 Extra person: €4 Unlimited travel, one price, through out Lower Saxony (see map above) for up to 5 people, 9 a.m. until 3 a.m. of the following day and on Saturday, Sunday and bank holidays from 0a.m. until 3 a.m. Valid on all local trains (Interregio-Express, Regional-Express, Regionalbahn, S-Bahn). Prices quoted are for 2017 ticket machine purchases only. Lufthansa is the national airline for Germany, providing a high level of service on all their flights to or from Germany. Daily flights are available to Berlin, Cologne, Frankfurt, Leipzig, Nuremberg or Stuttgart. Get the best prices with Easyjet, Air Berlin, Lufthansa, BMI, Eurowings or BA. Book and compare all flights and airlines on one site with Expedia. Most hostels in Germany provide amazing value for money accommodation. High quality, en-suite, single or double rooms are all commonly available for the budget conscious traveller. LateRooms.com offer a unique vehicle through which hotels across the globe can sell their empty rooms. In order to ensure rooms are filled, hotels are willing to drop their prices - whether this is at the last minute or up to 12 months in advance. Shearings Holidays is one of the UK's leading specialist tour operators. Shearings' collection includes the very best and most famous Christmas markets in Germany, travelling by coach or by air and embracing a superb selection of Christmas Market river cruises. Build your own holiday package and save with Expedia. Attractive discounts are available when booking a flight & hotel together. 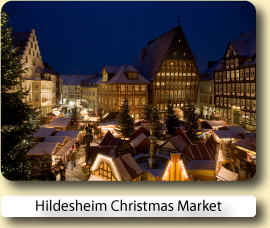 Book your hotel for the Goslar Christmas Market with Expedia or Hotels.com.Both online reservation services will let you compare and book hotels at great low prices.